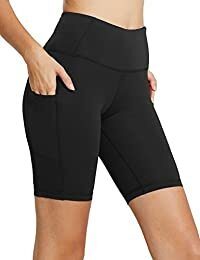 • Women's Tummy Control High Waist Sport Pants with Side Pockets. • Great for sports, fitness, yoga, workouts or any type of exercise. • Designed to help you move and stretch with ease. • Soft, breathable and comfortable..
• Lightweight, non see-through and machine washable. • High-rise, slip-free, tummy-flattening waistband. • Moisture-wicking fabric that keeps you dry during workouts. • Side pockets for your keys, phones and so on. • Chafe-free and ergonomic seams for a natural range of motion.